It's a pleasure to welcome science historian and writer Sarah Dry to the ClimateCultures blog and her contribution to A History of the Anthropocene in 50 Objects. Sarah's personal selection and the images she has chosen to illutstrate her objects strike a particular chord with the former astronomy student in me; and these three objects speak of the gap between seeing and feeling. Charles Piazzi Smyth (1819-1900) was a Scottish astronomer who travelled the world studying the heavens and the earthly atmosphere that so often blocked his view. He was an obsessive, spending long hours perfecting his observing technique with the telescope, the spectroscope and the camera. The photograph reproduced below (left) is one of 144 photographs of clouds taken by Piazzi Smyth in his retirement, from the window of his home near Ripon, North Yorkshire, during 1892 and 1893. He printed the photographs and bound them together in a handmade book of what he called Cloud Forms that Have Been To the Glory of their creator and the wonderment of learned men. Alongside each photograph, he included a page recording the time, temperature, pressure and weather conditions when each photograph was taken. His aim was to render the ever-changing clouds into something fixed which could be compared and used to generate a fuller understanding of the atmosphere. This was a continuation of a project that had begun with Luke Howard’s innovation at the start of the century, a nomenclature that distilled the multiplicity of possible cloud forms to just three basic forms. For Smyth, looking was its own end, and in looking he felt a connection with the divine. What moves me about this book is how it embodies the deep ambivalence within the culture in which Smyth lived, with which he himself struggled. On the one hand, he was driven to try to reduce the complexity of the clouds to a set of physical laws. He achieved great success in this endeavour, becoming Astronomer Royal for Scotland at the precocious age of twenty-seven and demonstrating that mountain astronomy was possible by leading a daring expedition up the volcanic mountain at Tenerife. On the other hand, he was moved to a kind of desperate faith at the thought of the endless complexity and prodigality of nature, in the face of which even the best recording devices were impotent. His late-life cloud photography was less a quest to master the skies than a form of surrender to the ultimate unknowability of divine creation. Today, we often try to separate science from emotion (to say nothing of science and religion), suggesting that to do good science is to be dispassionate. There may be very good reasons to try to carve out spaces from which emotion is explicitly excluded, but Smyth’s poignant book is a material reminder of the potential, within one individual, to embrace two very different ways of observing, and of knowing, the clouds. Today, we can sit at home and look through the magical window of the computer at the clouds from space. This is not, strictly speaking, a new achievement. The first Earth-observing satellite program, named Nimbus after the Latin word for rain cloud, was launched by NASA in 1964. 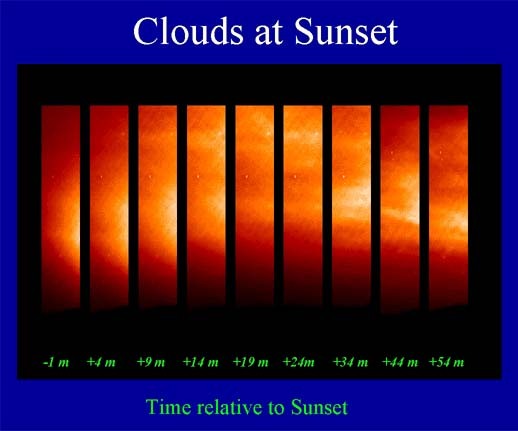 Since then, our vision of clouds from space has continued to improve, as instruments have gotten more sensitive and new satellites with new capabilities have been launched. Today, Nimbus’ successor, the less poetically named CloudSat, is part of the so-called A-train of six such satellites devoted to watching Earth. The kind of vision CloudSat provides is gratifyingly intimate, but it is also alien. CloudSat uses radar to cut through the clouds, revealing their insides as a surgeon’s knife reveals the inner organs of a patient. An animation (see below) of the inside of Typhoon Dolphin on May 16, 2015, reveals the dramatic structure of the inner eye of the storm, but it remains removed from human experience. That is, in fact, precisely the point. CloudSat reveals what would otherwise be invisible, the interiors of clouds and the storms into which they sometimes assemble. For all its scientific intent, this is a voyeuristic and even transgressive kind of vision, transposing the stark lines of the penetrating radar with the soft billows of the clouds, replacing the familiar vision of the clouds from below with a God’s eye view from above. Smyth made much of the portability and intimacy of the tools he used. He liked feeling the spectroscope in his hand and devised a special viewfinder to enable him to simultaneously look up at the skies and down through the viewfinder of the camera he used. My interface with the earth’s clouds is through my laptop, a portable but nevertheless impersonal device whose workings are opaque to me. Despite the grandeur of the vision it offers, my computer—and the vast network of technology it accesses—brings me, in fact, no closer to either the satellite which passes the earth’s equator every 99 minutes precisely, or the clouds it so relentlessly, and magically transects. I know what I am looking at but I don’t know how to feel. There are clouds of water on Mars. This came as a surprise to me as I researched this post. Only recently, scientists have realized that some Martian clouds are probably made of ice crystals, just like high clouds on Earth. Still photographs have been taken from the Curiosity Rover of moody Martian skies, ice crystal clouds brightening the glow of the setting sun. Even more remarkably, a series of photographs show thin stratus-like clouds in motion in the skies above the Curiosity Rover. Most clouds on Mars, however, are made not of water but of carbon dioxide, which makes up more than 95 per cent of its atmosphere (on Earth, it accounts for roughly 0.04 per cent). (Oxygen, on the other hand, is present at just 0.13 per cent, compared with 21 per cent on Earth). Most Martian clouds are, in fact, made up of tiny flakes of frozen carbon dioxide (no bigger than red blood cells) and they hover like giant foggy caps over the poles during Martian winters. These clouds, and the carbon dioxide-rich atmosphere they float in, represents both a challenge and an opportunity to those who would explore or colonize Mars. Here is where MOXIE, the Mars Oxygen In situ Experiment, comes into the story. It is a desktop-sized prototype for a tool that could put the carbon dioxide in the Martian atmosphere to human use. If all goes well, it will land on Mars sometime in February 2021 and start trying to produce oxygen at a rate of 10 grams an hour. The idea is that this oxygen could be used by human explorers both for breathing, and, critically, as a propellant for fuelling the return trip to Earth. The prospect of beginning to alter the atmospheric chemistry of Mars is with us. MOXIE already exists in prototype form and is expected to be part of the 2020 Mars Rover launch. As such, this little instrument contributes to the ultimate in futuristic thinking, the idea that humans can colonize Mars. MOXIE is a cute name for a jaunty instrument with a seriously ambitious goal that once seemed nearly impossible and now seems, depending on how you look at it, eminently achievable or wildly misguided. What would Piazzi Smyth say about both Musk and MOXIE, about the ambition of pushing out beyond our heavens and into the atmosphere of another planet? And what would he feel when looking at these images of Martian clouds? I am not even sure how they make me feel. Are they frightening, inspiring, or merely strange? I cannot decide and that inability to know my own feelings tells me more, perhaps, than any decipherable feeling would. The distance between me and the cloudscape of Mars is contracting at the speed by which data travels from the Mars rovers cameras and NASA’s Earth-bound computers. It will contract further as projects to explore and possibly colonize Mars proceed. Even as they seek, quite literally, to domesticate Mars, these technologies make me aware, as I have never been before, of all the things I cannot know about Mars. Piazzi Smyth’s cloud photographs, for all the hopes they represented of increasing our knowledge, ultimately left him feeling less enlightened and more reverent. As any good writer knows, what is not revealed often plays more powerfully in the imagination than what is. What we cannot see, in other words, we have to feel. There is more to learn about Charles Piazzi Smyth at Wikipedia. Cloud Forms that Have Been To the Glory of their creator and the wonderment of learned men and other of Smyth’s documents are held in the archives at the Royal Society in London. You can see NASA’s animation of the inside of Earth’s Typhoon Dolphin on May 16, 2015, revealing the dramatic structure of the storm’s inner eye, and their Curiosity Rover images of Martian ice crystal clouds at sunset and thin stratus-like clouds in motion above the planet’s surface. You can discover more about Elon Musk’s vision for Mars and ‘making human life interplanetary’ at Spacex. Back on the home planet, there is more to explore in the clouds at the Cloud Appreciation Society and the World Meteorological Organisation’s World Cloud Atlas. Click here for Sarah's ClimateCultures Directory page. Sarah Dry is a writer and historian of science interested in how narrative can create a bridge between people who hold different values about climate change.